I just finished entering all my 2009 field notes in an Excel file. I have been doing this every year for the past seven or eight years, and it has proved really useful. Among other things, it gives me a chance to review all the field notes and remind me of things that must be done in the 2010 field season. In addition, I am creating a database of all plant species present at Pleasant Valley Conservancy, including their locations and phenology. An important part of the computerized data are those for purple milkweed (Asclepias purpurea), an endangered species that arose spontaneously at Pleasant Valley Conservancy after we initiated restoration. Because it is a "savanna" species of considerable importance, I have been carrying out field observations ever since the first population arose spontaneously in Unit 12B in 1999. 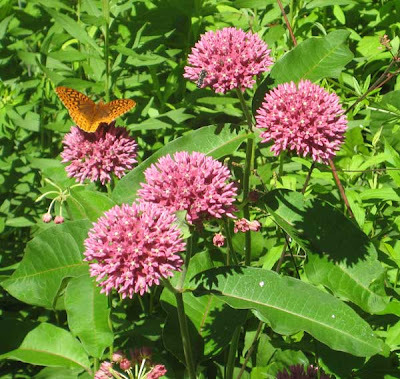 I published a summary of the purple milkweed work in the September 2009 issue of Ecological Restoration, which included all field and experimental work through the end of 2008. The analysis just completed adds an additional year of data. The first year I found a purple milkweed pod was 2001, and some years afterward I found none. Perhaps because we are currently in a wet period in southern Wisconsin, pod formation has been better lately, and this year I found 50 pods, the most ever. Pods were about equally divided between those forming on spontaneous plants and those on transplants. Interestingly, almost every year I find a new spontaneous population of purple milkweed, and this year I had an especially good one. When I do find such a population, I am never sure whether it has arrived completely on its own, or whether it is a place where I had thrown out seed some years ago. The unpredicability of purple milkweed growth is maddening. Every one of my populations has a permanent numbered marker, and at some locations there will be years without any plant, followed by years where there is a flourishing plant. All, presumably, without the effects of any human agency. I'll report on some other results from my 2009 database in later posts. Kathie and I spent a week in South Carolina and part of the time we visited several interesting longleaf pine savannas. The longleaf pine (Pinus palustris) is a fascinating fire-controlled ecosystem that has probably been responsible for the strong use of prescribed fire in southeastern U.S. The longleaf pine belt extends across a NE/SW tending band from southern Virginia through western Mississippi, with outliers farther west. It is considered one of the most endangered vegetation types in the U.S., but is making a strong comeback because of the wide use of prescribed fire. Every state in the southeast has an active Prescribed Fire Council, and state and federal forestry makes strong use of fire. In our visits to this area, we have been impressed by how extensive the prescribed burns are, with single burn units of thousands of acres. Historically, the longleaf pine ecosystem was maintained by frequent (3-10 years) low intensity fires, generally caused by lightning or people. Landowners conducted what was called "light burning", and even after fire had almost been suppressed elsewhere in the U.S., fire continued to be used here. However, Smoky Bear eventually made inroads even here, and by the mid part of the 20th century, the use of fire had almost ceased. However, through the strong stimulus of the Tall Timbers Research Station (based on the Georgia/Florida border), prescribed fire has been brought back, and is now considered an "essential" tool in ecosystem management. Everywhere we saw longleaf pines, we saw evidence of fire. In one area in the Francis Marion National Forest, we drove for 3 miles (!) along the edge of a longleaf pine forest that had been burned sometime in the past several weeks (see photo at end of this post). The size of such a burn unit boggles the mind of a midwesterner! 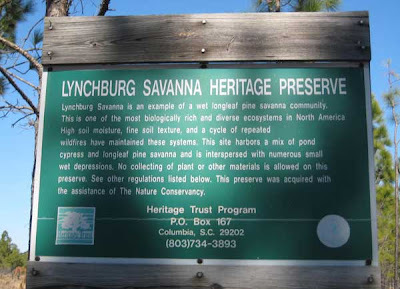 One of the more interesting areas we visited was Lynchburg Savanna Heritage Preserve, a South Carolina site that is equivalent to one of our State Natural Areas. This site was acquired by the S.C. Nature Conservancy and turned over to the state for management. This site is noted for its exceedingly high understory diversity. "The Carolina Sandhills NWR lies along the fall line which separates the Piedmont Plateau from the Atlantic Coastal Plain. The rolling beds of deep, sandy soils which give the region its name were once host to an extensive longleaf pine forest. 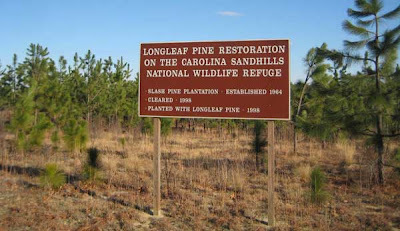 The longleaf pine/wiregrass ecosystem, the characteristic habitat of the Carolina Sandhills refuge, once covered more than 90 million acres across the southeastern United States, stretching from Virginia to Texas. This unique ecosystem, shaped by thousands of years of natural fires that burned through the area every two to four years, has been reduced to fewer than two million acres. Today, only scattered patches of this once immense forest remain, with most occurring on public lands. Factors contributing to the demise of the ecosystem include aggressive fire suppression efforts, clearing for agriculture and development, and conversion to other pine types." One of the sites we visited at Carolina Sandhills reminded me of the sorts of restoration work we do in Wisconsin. 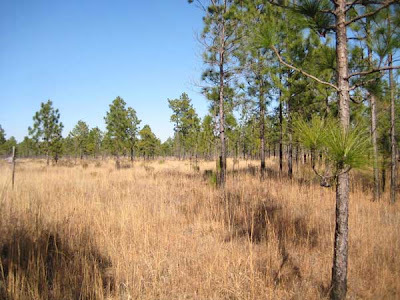 An area that had historically been longleaf pine had in 1964 been planted to slash pine (Pinus elliotti), used for pulp, timber, or turpentine. At this site the F&WS removed all the slash pine and in 1998 planted longleaf pine. The sign below tells the story. The longleaf pine species has interesting adaptations to fire. An early stage in the growth of a new plant is called the "grass stage", because it resembles a clump of grass more than a tree. During this stage, the terminal bud is protected beneath a thick coating of pine needles, so that when fire sweeps through the area, the needles may burn off but the growing bud is protected. During the grass stage, which can last for 1-7 years, the plant remains close to the ground. When the diameter of the root collar gets large enough (about 1 inch), the plant starts to grow in length, the terminal bud being released from its protective layer of needles. At this stage, which is called the "bottlebrush" stage, growth is extremely rapid, and the terminal bud reaches a height where it is above the frequent low-intensity fires that occur in this sort of ecosystem. Additionally, the terminal bud is in a favorable position in relation to sunlight. At this stage the bark thickens sufficiently so that the plant becomes resistant to fire. From here through the sapling stage and on to the mature plant, the tree establishes a unique fire resistance. 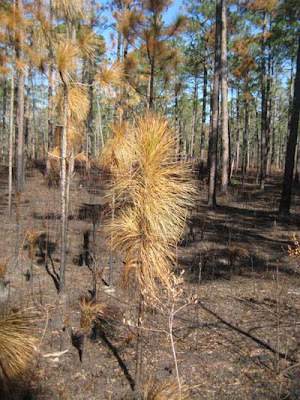 The long needles of the longleaf pine thus play an important role in permitting the early stages of growth to survive fire. The photo below shows longleaf pine plants that had just been burned a week or so earlier. The photo shows how the peculiar array of needles works to protect the terminal bud from fire damage. 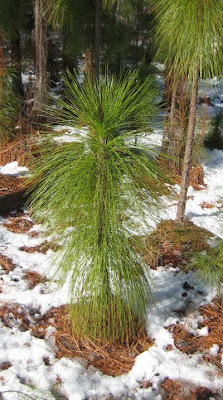 As its name states, the needles of the longleaf pine are exceedingly long, up to 18 inches long. These long needles make the identification of P. palustris fairly easy, since no other pine has needles this long. When we visited the southeast two years ago, it was in the middle of the fire season, and we saw fires everywhere. This year the weather was much wetter (with some snow! ), and lots fewer prescribed burns had been carried out, although the fire shown in the photo here, from the Francis Marion National Forest, had been done within the past two weeks. The cut stems of some clonal species, such as gray dogwood (Cornus racemosa), are quite sensitive to glyphosate but grow as dense stands with lots of small stem close together. The conventional way of treating these cut stems with a spray bottle is very time consuming and quite wasteful of herbicide. For the past five or six years we have been using a technique that we learned from Dale Karow that really works. It makes use of foam paint pads (2 or 3 inches wide) that you can buy at any hardware store. The pad has a wooden dowel on the end, which is inserted into a hole at the end of a broom stick or plastic tube. The foam pad is loaded up with herbicide from a spray bottle carried in the other hand. The target clone is cut with a motorized brush cutter equipped with a very sharp saw blade. (The blade is sharpened in the field each time the cutter is gassed up.) One person with a brush cutter can keep two or three (or even four) "treaters" busy. No stooping is needed, and a dozen or so cut stems can be treated without moving. 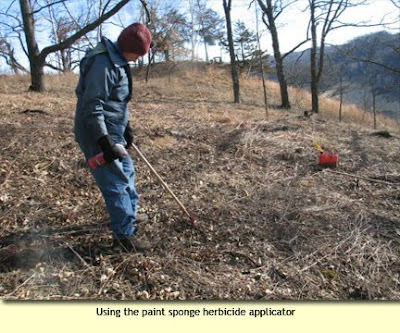 A red dye is added to the herbicide in order to keep track of which stems still need treating. Yesterday we used this technique at Black Earth Rettenmund Prairie on a large patch of prairie willow that had started to take over the top of the north knoll. Although this is a native species, it had begun to spread rather extensively, and since this is an area with lots of "good" forbs, such as wood lily, seneca snakeroot, false toadflax, butterfly weed, etc. etc., we felt it should be controlled. The goal here was to reduce by about one-half the amount of prairie willow in this area. Willis ran the brush cutter and Kathie and I followed along with the herbicide. The foam pad technique was ideal for this purpose, as the photo below shows. One of the great advantages of this technique is that it is very economical of herbicide. If you sprayed each of these cut stems from a spray bottle, it would be very difficult to confine the herbicide to the cut stem itself, but with the foam pad, a simple "touch" to each cut stem takes care of it. With the foam pad, all of the herbicide is confined to the stem. In summary: this technique makes use of crew of two to four people. One operates the brush cutter and the others follow along with herbicide sticks and quickly touch each cut stem. The red dye, an essential part of the technique, shows which areas are still to be treated. An operator can stand in one place and treat at least a dozen cut stems, often more. The red water-soluble dye is available from, among others, Crop Production Services. The foam pad technique is great for a volunteer work group. No stooping, no wasting herbicide, very quick. Strongly recommended! Over the years that I have been watching the snow melt on the south-facing slope of Pleasant Valley Conservancy, I have noticed the patchiness of the melt. As the photo today show, there are bare strips and then there are strips with snow. Walking across this slope, I was impressed with how much snow there was in some of these strips, and then nearby there was no snow at all. In the area shown in the photo, there are at least two factors (in addition to the sun angle) which influence the snow melt. One is the big bur oaks themselves. You can see snow-free zones on the south sides of the trunks of all the trees. This is due to the fact that the large trunks absorb lots of the sun's rays and then transmit the heat to the snow surface. The second reason is that the "slope" of the south slope is not uniform. As you climb up the hill, you go from a fairly steep climb, to an area where the ground is almost level, and then it starts to get steep again. This is because of the presence of a bedrock layer of Black Earth Dolomite, which is more resistant to erosion so that it remains level when the sandstone layers on each side erode extensively. Because the snow is level here, it gets less of the sun's rays, and hence melts less fast (or not at all). The complex topography here influences the development of plants during the growing season. In fact, certain species are found along the Black Earth Dolomite and nowhere else. 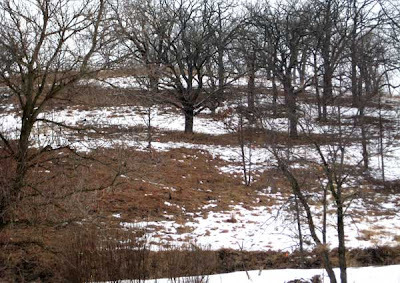 Also, some species are found on the north-facing sides of the big bur oaks but not on the south-facing sides, which correlates with the snow patterns you see in the photo. 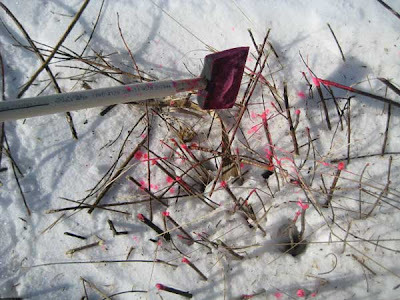 Hopefully, the snow will soon melt completely (and stay away), so that we can start doing serious brush work by basal bark.